Yummy! If you are looking for a dish that is tasty, healthy and relatively quick to to cook, try this pan-fried salmon dish. I dry-fry the walnuts over a medium high heat for 2-3 minutes before chopping them up, but you don’t have to do that. PS! 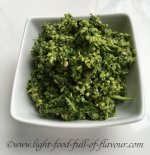 I use tenderstem broccoli (broccolini) in this recipe. This type of broccoli is by far the richest source of Glucosinolates - one of the most important anti-cancer and liver-friendly nutrients found in food. Glucosinolates are also found in broccoli, Brussels sprouts and other cruciferous vegetables. 1. Start by making the vinaigrette. Bash the chopped anchovy and garlic in a pestle and mortar into a paste. Add the olive oil, lemon zest, parsley, chopped walnuts and season with a bit of black pepper. Stir it all together. 2. Put a pan with some salted water on to boil for the vegetables. Add a bit of oil to a frying pan over a medium-high heat. Season the salmon fillets with salt and pepper and place them - skin-side down - in the pan and cook for about 4 minutes - until the skin is crisp. Turn the fillets and cook for a further 2-3 minutes or until just cooked. 3. While the salmon is frying, add the green beans to the pan with simmering water. Boil for 2 ½ minutes, then add the tenderstem broccoli (broccolini) to the pan as well and simmer for a further 2 ½ minutes. Drain the beans and broccoli and return to the pan. Add the vinaigrette to the vegetables and toss until all the vegetables are coated with the vinaigrette. 4. 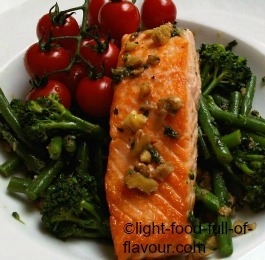 Divide the beans and tenderstem broccoli (broccolini) between 4 plates and top with the pan-fried salmon fillets. Squeeze a bit of lemon juice over each portion.